A twin over full bunk bed for children. 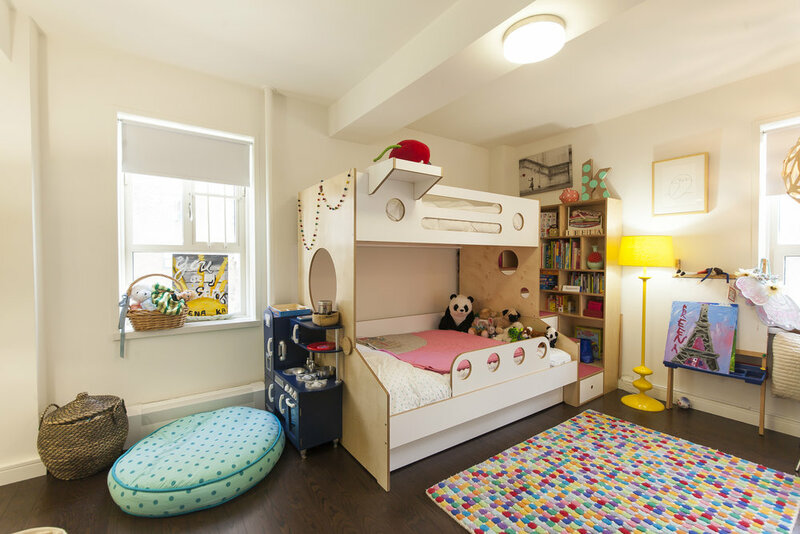 When Leela and Kareena’s parents needed a sleep space that incorporated storage into a tight corner, they turned to Casa Kids to create a custom furniture configuration that worked for their space and could convert into two beds when the girls got older. Leela and Kareena’s Marino Twin bed sits over a full sized lower bunk, with storage stairs and a trundle bed beneath it for guests. An additional, removable guard rail on the lower bed protects young children who might roll out of bed. A column in the corner of the room could have meant wasted space. We built custom bookshelves to fit against the wall alongside the stairs, around the column that would have obstructed them. These bookshelves not only incorporate seamless storage, they also serve as additional handrails for kids to grab when using the stairs. The lower bed can be detached and used independently, and carpeting on the stairs adds extra comfort, anti-slip safety, and a pop of color to our classic birch finish with white accents. For more information on this room or others like it, please fill out the form below.